Our specialist Community Safety Team works closely with partner agencies to help prevent and tackle anti-social behaviour (ASB). We work with people who are committing ASB to support them to change their ways. However, we will take action if necessary. 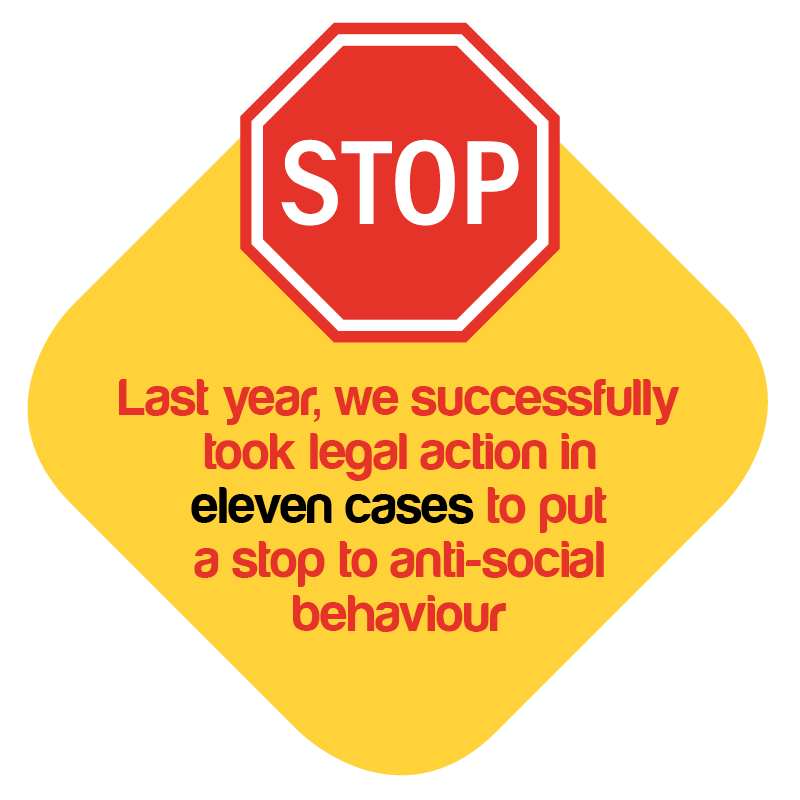 Last year, we successfully took legal action in eleven cases to put a stop to anti-social behaviour; we gained four ASB injunction orders (three of which came attached with the Power of Arrest), obtained four suspended possession orders, and one tenant was evicted due to their ASB. We also attended two committal hearings for breach of an injunction order, where the injunctions were extended and further sanctions imposed for those breaches. Over the last year we dealt with 458 cases of ASB. 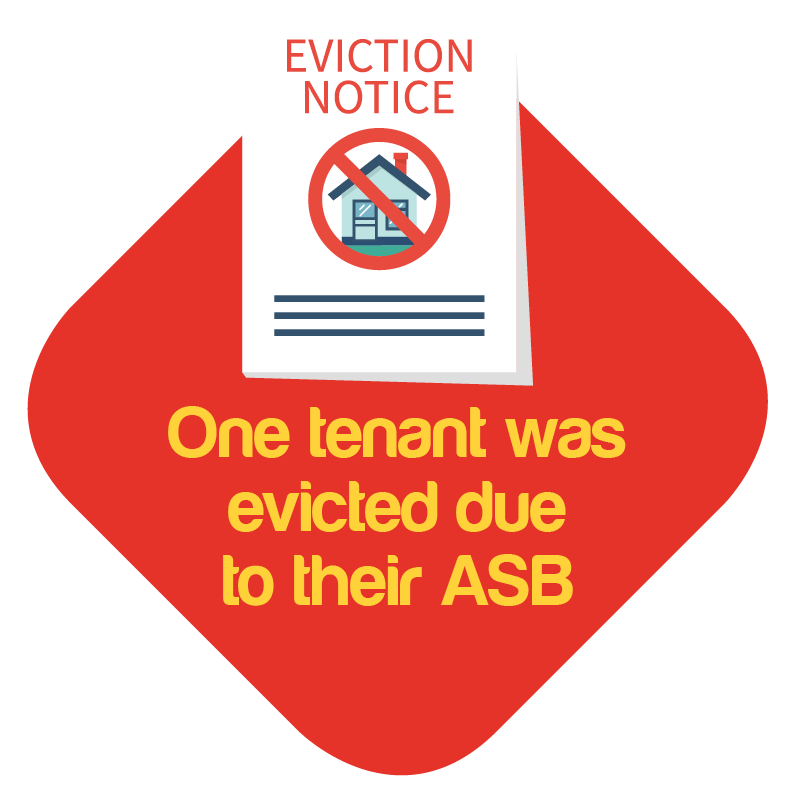 It took us an average of 50 days to clear ASB cases. This is compared to 621 cases last year and an average of 95 days to clear a case. 63.6% of customers told us that they were satisfied with the way their ASB case was dealt with, and 78.1% were satisfied with the outcome. This is a reduction from last year where 94% of customers were satisfied with how their case had been dealt with and is an area for improvement in the forthcoming year. We understand that we alone are not equipped to deal with all aspects of ASB. For supported living customers, we work closely with local authority commissioners, tenants, advocates and support providers to ensure our tenants are fully supported if they experience any issues in their home. We provide a 24-hour witness support service for victims and witnesses of ASB. Last year we supported 13 witnesses through our witness support service with 78.1% of customers satisfied with the service they received. This is a reduction from the previous year when we scored 100% in customer satisfaction by the 21 witnesses we supported.